Anyone that lives in the Eastern United States, from Maine to Tennessee, is certainly familiar with the awful stench of the Eastern Skunk Cabbage: a foul odor released when its leaves are broken underfoot by a hiker. The scientific name of this plant, Symplocarpus foetidus, actually includes a variant of the word, fetid, which means “stinking, rank, or offensive”. Just as impressive as its smell is offensive, however, is the remarkable ability of this plant to carve its own little niche in the snow. In an effort to be among the first plants pollinated when insects begin stirring in early Spring, the Skunk Cabbage actually melts its way through several inches of snow and ice in the dead of winter! 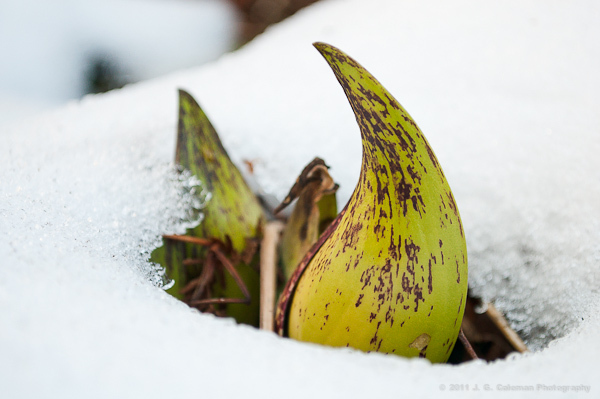 The pointy protrusion in the photograph above is known as the spathe, a hood that surrounds the flowering parts of the plant, and it can reach temperatures as high as 30°F to 40°F warmer than the frigid winter air. So as cold weather gives way to Spring, the Eastern Skunk Cabbage has already been developing for months. The specimen seen here was found growing beside a forest stream in Wallingford, Connecticut in late February of 2010; it had likely sprouted more than a month earlier. Photograph of Eastern Skunk Cabbage © 2011 J.G. Coleman Photography. View more photography by Trails of Freedom Chief Researcher, Justin Coleman, at J. G. Coleman Photography.